by Adam L Silvermanat11:50 am on April 27, 2016 . It has 264 Comments. The economic impacts of our foreign policy, specifically the defense components of maintaining an expeditionary force posture with significant overseas basing, exercise, and operational commitments. Mr. Trump has repeatedly asserted that our allies, partners, and clients have been taking advantage of us, they are costing us tremendous amounts of money, and that they will have to start paying up and beefing up their own defenses or they could find themselves without American military support. NATO. Mr. Trump has repeatedly asserted that NATO is obsolete, too expensive, and not doing much for the US but getting it into trouble. Interestingly enough this is very close to the position held by Vladimir Putin. It should be interesting to see how Mr. Trump presents this portion of his speech since hiring Mr. Manafort as his senior advisor. Mr. Manafort’s has ties to Vladimir Putin, originally via Victor Yanukovych, for the purposes of shaping opinion in regards to Russia’s actions in Crimea and the Donbass. Nuclear Weapons. Mr. Trump has repeatedly argued that nuclear weapons are a terrible threat and at the same time argued that if Japan and South Korea don’t open their wallets and start paying the US to secure them, then it would make sense for them to develop their own nuclear deterrent for dealing with North Korea. China. Mr. Trump has relentlessly and repeatedly hammered that China is killing us economically while saying he alone could do proper and profitable, Nation to Nation, business with China. It will be interesting to see and hear what, if any, actual strategy Mr. Trump has to accomplish this. Terrorism. Mr. Trump has repeatedly argued he is the only one who will get properly tough with terrorists, especially the Islamic State and its supporters. He has asserted that he would bring back water boarding and then transition to worse, would target the families of terrorists, and would knock the Islamic State out so fast. Here too it will be interesting to see what, if any, specifics are brought forward and how coherent they are or are not. Here’s a link to the live feed, which I’m going to try to embed below. I’ll be back later tonight with an policy and strategy analysis of his remarks (and hopefully a link to the full transcript provided a transcript is released). This post is in Domestic Affairs, Election 2016, Foreign Affairs, Politics, Silverman on Security and has 264 Comments. by Adam L Silvermanat7:50 pm on April 24, 2016 . It has 170 Comments. PBS is airing a three part documentary on the Easter Rising tonight. SundanceTV is also showing a three part series on the Rising starting tonight as well (h/t: Charles Pierce). 100 years ago today a group of Irish republicans launched an insurrection against the British occupation and in support of home rule and autonomy. One of the most remarkable things about the Easter Rising was the significant role played by over 200 women from the Cumman na mBan/The Irishwomen’s Council. The role of women in revolutionary movements and other forms of low intensity warfare is often overlooked or under appreciated. While the role of women in seeking to end revolutionary conflict, especially that in Northern Ireland is well known, what is less often remarked upon is the role women play in promoting revolutionary conflict. In regards the Irish Troubles, women played a tremendous role in transmitting the ideals of Irish republicanism and the idea and cause of a free and autonomous Ireland. This often took the form of inculcating these beliefs in their children and grandchildren and provides an excellent example of social learning. I’m looking forward to seeing how tonight’s documentary deals with these and other issues relating to the desire for autonomy, self determination, and the decision making process that leads a significant portion of a movement to chose to rebel, rather than take some other form of political or social action. This post is in Foreign Affairs, Silverman on Security and has 170 Comments. by Adam L Silvermanat10:01 pm on March 13, 2016 . It has 107 Comments. Yes, you read that headline right. Given all the insanity we’ve been covering this weekend, I thought it would be good to post about something nice for a change. When the Vancouver, BC hotel that was hosting the annual VancouFur convention turned out to also be one of the temporary housing sites for Syrian refugees that have been admitted to Canada something really wonderful happened. The anthropomorphic animal reenactors reached out to the refugee children to welcome them to Canada. Mike Schmidt, who attended VancouFur wrote on Vancity Buzz: “One of the many highlights for me was when the new group of Syrian refugee children came in and got to interact with us. To them we were cartoons to come to life, to us [it] was a means to display our acting performance to a very appreciative audience. Click on over and see the videos and more pictures of the refugee children having a great time interacting with the furries (the first one is autoplay). This post is in Because of wow., Cat Blogging, Critters, Dog Blogging, Faunasphere, I Reject Your Reality and Substitute My Own, Open Thread, Other, Popular Culture, Silverman on Security, Someone Somewhere Is Having More Fun Than I Am, THIS WAS AWESOME, Travel and has 107 Comments. by Adam L Silvermanat10:49 pm on March 10, 2016 . It has 170 Comments. I normally stay out of the domestic politics side of things here at Balloon Juice, especially around the current Presidential primaries – on either side, other than posting debate open threads. But I’ve been watching tonight’s GOP Primary Debate on delay – I set the DVR as I had some stuff to do and I’ve just gotten to Dana Bash’s questions on Social Security. As I listened to the different candidates’ answers to her question I was struck by Mr. Trump’s response. Mr. Trump, as part of his answer to the Social Security question, delineated a number of the places that we have military personnel deployed on a more or less permanent basis. While I’m paraphrasing, he stated that we protect Saudi Arabia and Japan and South Korea and we don’t get anything for it. That the Saudi’s were, at one point, making a billion dollars a day and they weren’t doing anything for us, despite our protecting them. And that we’re going to renegotiate and get better deals for what we’re doing militarily and that will provide the funds to shore up Social Security. This is a very important glimpse into how Mr. Trump understands foreign and defense policy. Intimating that the US would, under his leadership, negotiate foreign basing of US military personnel and security alliances in exchange for payment is a major break with how the US has and continues to do business. What Mr. Trump is proposing is that America would stop being a superpower and instead become an empire. This is something that not even the most hawkish neo-Conservatives or neo-liberal interventionists have proposed. At least not publicly or in any forum I’ve ever seen or heard. What Mr. Trump is suggesting in his answer about where to get the money to shore up Social Security is a radical change to how the United States does business. It means changing the United States from being the sole remaining superpower into being an empire. Empires seek tribute in exchange for their beneficent protection. One of the major changes in Athens, and Athenian democracy, a change that was not for the better, occurred prior to and as one of the contributing factors to the Peloponnesian War when it started abusing the tribute collected by the Delian League. While American democracy and Athenian democracy are not very analogous, the Athenian slide into empire should stand as a cautionary tale for the US and place charging for basing American military personnel beyond the pale. The Athenian envoy to Melos stated, in one of the most important and cautionary portions of Thucydides’ History of the Peloponnesian War, that: “the Strong do what they can and the weak suffer what they must”. The taking of tribute and the path of empire leads to the Athenian destruction of Melos and that is not a path that the US should follow. * Full disclosure: during my assignment as the Cultural Advisor at the US Army War College (2010-2014), I was the academic advisor (front line supervisor), the primary research advisor, and/or the faculty/community sponsor for almost a dozen senior foreign officers attending the US Army War College resident course as International Fellows. In my professional opinion the presence of these gentlemen in the schoolhouse provided as much, if not more, benefit to the American officers in the resident program than it did to these officers themselves. They brought unique perspectives to the global strategic problems that we were grappling with in the seminar room, as well as important cross-cultural perspectives to critical and strategic thinking and how to go about making strategy and policy. This post is in Domestic Affairs, Foreign Affairs, Military, Politics, Silverman on Security and has 170 Comments. by Adam L Silvermanat1:53 pm on January 14, 2016 . It has 42 Comments. The Islamic State attack in Jakarta earlier today is part of the same campaign as the Paris attack last November. While the Jakarta attack was no where near as successful in terms of casualties, including those killed, the objectives of the attack was the same as of last November’s in Paris. Islamic State has two objectives for their attacks – both related. The first is to attack the Gray Zone; the social and civil space** that Muslims live in. It is an attempt to force Muslims, whether in the US or Britain or France or Indonesia or Jordan or anywhere else, to chose sides. To define themselves not only as Muslims, but as Muslim in such a way that sets them apart from their fellow citizens. It is both a figurative and literal attempt to collapse the public realm/sphere into the private one. The Islamic State hopes that by doing so they can then achieve their objectives of recruiting Muslims to relocate to the Caliphate – the only place where actual Islam is being practiced or to stay in place and use their local knowledge to attack targets that further weaken the Gray Zone. So the first objective is to set the conditions for recruiting by attacking the Gray Zone. The second of the Islamic State’s objective with the Jakarta attack, just as it was with the Paris attack last November, is to get the US, its allies and its partners to provide the ways and means that the Islamic State does not have to achieve IS’s ends. This is terrorism as Psychological Operations (PSYOPS). While Indonesia still has its socio-political problems, they’ve come a long way from the Suharto and Sukarno regimes. This is summed up in what has become the Indonesian national motto: bhinneka tunggal ika, which means unity in diversity. The attacks earlier today are intended to shatter, if not reverse, Indonesia’s attempts to achieve unity in diversity. IS hopes that the Indonesian response, a crackdown on Muslim Indonesians, will destroy the Gray Zone, providing the Islamic State with new recruits and a justification for further attacks, which will then lead to greater crackdowns, as well as the imposition of security protocols that erode the Indonesian political, social, and economic reforms of the past eighteen years. Moreover, they hope that attacks in Indonesia will lead other states and societies to react out of fear and panic, eroding their Gray Zones and putting a truth to the lie that ideals of liberty and freedom and diversity are just a facade. The Islamic State cannot achieve these ends themselves. They are hoping we will be so scared as to do it for them. The Islamic State’s goal with these attacks, in terms of trying to destroy the Gray Zone in Indonesia, which is a Muslim majority country, is for Indonesia t0 crack down on those Indonesian Muslims that it identifies as supporting the Islamic State. As I’ve written about in past posts, the Islamic State’s doctrine/theology is that real Islam is rooted in Abd al-Wahhab’s radical understanding of tawheed*** (the unity of the Deity) combined with Abd al-Wahhab’s calls to eliminate innovation, apostasy, and unbelief. Since the Islamic State asserts that Muslims that adhere to Islamic State’s doctrine/theology are the true Muslims, Muslims that crack down on Islamic State or Islamic State supporters can and will be labeled apostates. This allows IS to renew and/or reinforce their call that the Muslims involved in running Indonesia or supporting the governments efforts are unbelievers or apostates. Such assertions contribute to the attempted destruction of the Gray Zone by allowing the Islamic State to reinforce their central tenet of radical tawheed. This provides the justification for future attacks against the unbelievers and/or apostates, including what they’ll claim are innovative Indonesian Muslim practices. The intent is to drive both recruitment and crackdown, then use that for more attacks to drive more recruitment and crackdown. * Image taken from here. It was originally part of an IS publication. 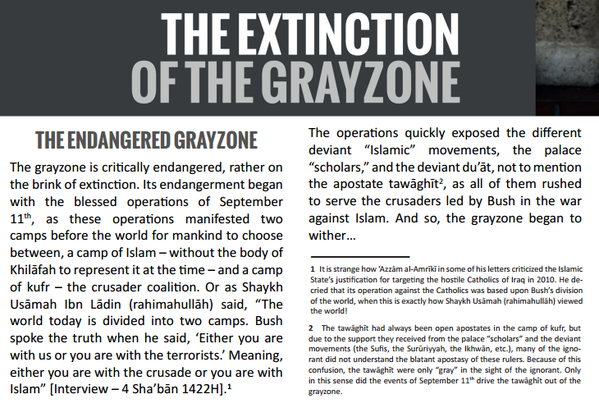 ** The Gray Zone is not just the social and civil public space in which Muslims live. Everyone lives in it when not in private. We can see it under attack by Ammon Bundy and his followers in Harney County, Oregon among white, Christian Americans just as it is under attack in Paris and Jakarta and other places by the Islamic State. *** All Muslims accept tawheed, but not all Muslims accept the radical understanding of tawheed as taught by Abd al-Wahhab. This post is in Foreign Affairs, Security Theatre, Silverman on Security, War and has 42 Comments.